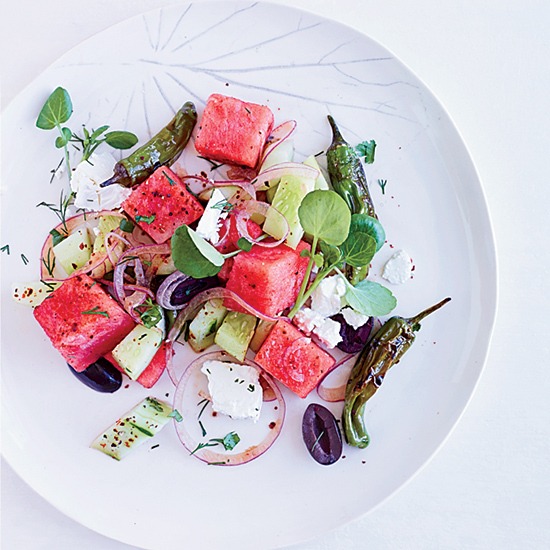 The combination of sweet watermelon, salty olives and creamy feta makes this salad from cookbook author Melissa Clark addictive. This refreshing and complex salad—made with jicama, watermelon, papaya and a bold tequila-based vinaigrette—usually includes little pieces of deep-fried tortilla rounds. To keep the ingredient list in check, omit the deep-fried tortillas (or opt for store-bought chips). According to Tom Colicchio, "Radishes are the unsung heroes of the vegetable world." Here, he tosses them with watermelon, chiles and an Asian fish sauce dressing for a refreshing salad. Sugar-crusted watermelon resembles a seared tuna steak in this dynamic dish.